This entry was posted in Uncategorized and tagged canards, cycling, cycling revolution, politics, what won't bring about mass cycling. Bookmark the permalink. This shows cycle commuting in Inner London rising to an even-more-dizzying height of one in ten and Outer London performing a reverse-plummet and heading back up to 3% or so. You’re absolutely right though that a lot of this is subject to factors not linked to cycling policy. I’d be surprised if the Inner London trend turns out to be a 40-year blip, though. That describes my commute – residential streets…shared-use path on 1990’s estate…short sustrans segment…muddy bridleway. I’m probably as invisible to statistics as I am to most local people. I would probably drive if there was no offroad route. Not sure what that says for your argument. Thanks for great post. One conclusion I could hypothesise – without having searched for any scientific evidence to back it up, but referring to my personal, anecdotal, experience, is that the broadly horizontal trend of the graph disguises a distinct polarisation over recent years. I don’t anyone can deny that cycling has increased n London, even if the more recent trending (since 2006?) 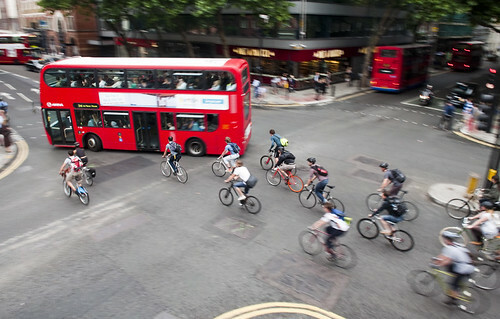 is for the same number of cyclists to make more cycle journeys. And if that implies that some people are extending their bike use to business trips during the day, having started just with the commute in/out, just as I have done, that surely is not a bad thing? Anyway, before I started cycling, I used to observe perhaps a dozen bikes pass me as I walked over Blackfriars Bridge around 9am. By the time I had actually started, that number was up to about 25-30. On the rare occasions I now walk across instead of cycling, I would say it is nearer 50. (Not scientific, but at the same time of day, assuming that the time it takes me to walk across has remained roughly constant, it is fairly consistent). The City of London is planning for cycle parking (on-street or off-) based on 10% of its projected 370,000 daily commuters arriving by bike. Outside cities, I used to see very little casual cycling (not events etc), and I see even less now. Country roads have become busier and faster, and I believe it is correct to say that in terms of statistics they are far more dangerous for cyclists, even if it doesn’t always feel like city streets are safer. Certainly my personal experience is that a couple of outings on my local country roads, having cycle-commuted, in town and City, and run down to the supermarket for some years already, sent me straight into the nearest bike shop to buy a MTB so I could do my riding off-road instead. Non-urban or suburban cycling will not have the same draw as inner city cycling, whatever the perceptions of risk are. The distances have simply become too great for most ordinary people to contemplate cycling them. 5 miles must be about the limit for even quite enthusiastic types, and where I live, journeys to local schools, jobs and shops could quite easily be further than that in some cases. The real scandal for rural dwellers however is the way that the hegemony of the private car has ensured that alternatives simply don’t exist. Firstly, cars made it possible to travel further, then people responded by moving out of town where they could provide more parking, or housebuilders could build further from the town centre and evade responsibility for providing local facilities. The ease and convenience of the car killed the local bus service, and finally the volume and speed of cars made walking or cycling non-viable anyway. The issue of transport poverty in rural areas has mushroomed as a result – some people either can’t afford a car at all, or have to scrimp to get together enough money to buy an old banger. For those who can barely pull together a few hundred quid for a banger and then shell out for the insurance and VED, the price of fuel is really felt (by which I am emphatically NOT saying we should make it cheaper – I don’t know the right answer but it surely isn’t to make driving even cheaper for the affluent middle class). So what do they do? We need rural bus services back first. PaulM: To answer your question about rural areas only having one option, is to provide rural bike paths. Separate from the roads and good enough quality. Not sure how that would be done but a start is to have a path from one village to another. Then add another and so on. Add one per year. Get the local people involved in making them and wanting them. The last 50 years has seen the disappearance of cycling by factory workers. There are fewer factories, they are further from home, they are in low-density parks on the edge of town. A factory worker will be expected to move jobs more often or expected to take the van home and go out on the road in the morning. Cycling to Park Royal Trading Estate or Fords at Dagenham has been replaced by cycling by young professionals to central London. Genius idea to juxtapose comments trumpeting the exact opposite of what the data shows. This shows one of the tests of a good measure in operation, that it shows data over time. I would bet money that most of those comments came when some reported number was larger compared with one other number, i.e. one quarter compared with the previous quarter, without looking at the long term predictable behaviour of the chart, i.e. flat lined. Pingback: Singletrack Magazine | Columns | Bez: "The Wedge"